Pressure washers are powerful tools for cleaning, but sometimes they need some help in loosening dirt and grime. That’s when pressure washer soap comes into the picture. The mixture of water and soap cleanses faster and better than using only water in the pressure washer. You use soap to wash dishes and to wash clothes, but the soap isn’t the same. Washing clothes require a different kind of detergent than washing dishes. It works the same with the chemicals used in pressure washer detergents to clean cars, driveways, home sidings, pool decks, and outdoor furniture. 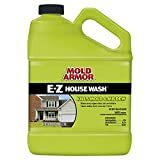 Lets look at the best power washing soap for all occasions. When washing a vehicle, be mindful that you don’t park on a gravel driveway when using a pressure washer. You can click here for our guide to buying a great power washer. While unlikely, it’s possible that the pebbles and rocks of your driveway could become airbourne weapons when hit with a high-PSI water stream. No one wants dents and dings from washing their car. Another tip – avoid parking close to objects you don’t want to get wet. 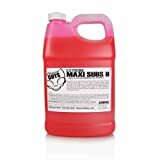 Chemical Guys CWS-101 Maxi Suds II is an all-purpose washer detergent that removes dirt without stripping wax and sealants. The formula contains water softener to reduce streaking and water spots. Two to three ounces of the concentrated detergent in a gallon of water is sufficient for a foamy wash that has a pleasant cherry smell. Green-friendly formula means you can clean and not harm the environment. Spray on, wash off for easy application on tough rust and scum spots. Star Brite Ez-On Ez-Off is a more environmentally friendly formula than the average acid-based solvent that removes deposits on boat bottom scum line, and rust stains. The unique patented buffering process makes it a safer product than most acid-based boat bottom cleaners. It’s still an acid, so take normal safety precautions when using. Using the combination of power-washer detergent and water should clean most of the grime, mildew, stains, and skid marks from the driveway and sidewalks. Concrete isn’t solid, so be mindful of using the right pressure washing techniques, so you don’t damage it. Karcher Multi-Purpose Cleaning Detergent is ideal for cleaning multiple surfaces like driveways, stones, bricks, and sidewalks. The built-in cup makes it easy to measure – you’ll have no problem getting the water to soap ratio to 20:1. As a bonus, this product works great in foam cannons as well! The Zep-All-In-1 Premium cleans concrete, metal, stone, tiles, stucco, vinyl, brick, and fiberglass. It doesn’t clean glass well and is not recommended to use on deteriorated surfaces like old wood and paint. The washing concentrate removes algae stains, mold, and mildew from driveways and walkways. When tackling a dirty wood fence or deck, it’s better if you do a first pass with the washer to remove any loose surface grime and dust. This will allow the pressure washer detergent to work on the deeper dirt and mildew that have built up on the surface. Make sure you use the right color tip so you don’t damage the wood surface when removing the soap. 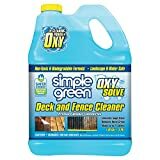 Simple Green Oxy solve is a biodegradable product that meets the criteria of the EPA’s Safer Choice Program. To clean grease, mold, and sap from trees Simple Green relies mainly on the cleaning function of natural peroxide. This pressure washer soap is great – when used on vinyl and PVC it removes the discoloring caused by mildew and mold. Krud Kutter Deck and Fence is a water-based biodegradable concentrate. It contains ‘Sporex’ that removes stains from moss, mildew, algae, and fungus. Particular surfactants dissolve tough stains from bird droppings, tree sap, oil, and grease. Pressure washing soap can clean house sidings and remove mold from sidings on the shady side of the house. The power of the pressure washer may influence to what extent spiderwebs and other dirt is removed. Brigs & Stratton Multi-purpose concentrate removes dirt, grime, and mold from house sidings, patios, and around pool areas. Although the product is biodegradable, the manufacturer recommends safety precautions like with any concentrate. Ideal to use for vinyl, aluminum, and wood sidings. Mold Armor FG503 cleans exterior mold, mildew, and algae stains without scrubbing. For typical stains dilute 3 to 1. Apply with a gardens sprayer or sponge and use the pressure washer to rinse off any chemicals. White vinegar is a common household item that won’t harm pets or plants but does kill mildew and mold . 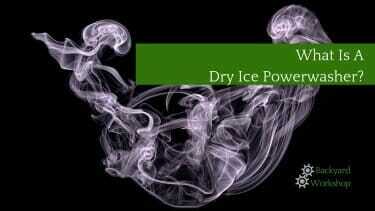 Its acidic properties remove water stains, lime deposits and dissolve soap scum. For the 9% of mold, vinegar doesn’t kill, baking soda will. Mix half a cup of white vinegar with a quarter cup baking soda to a gallon of water. Bleach works like vinegar but is harmful to plants, animals, and the environment. Prewash the surface with hot water to loosen tough stains and dirt. Mix 1/3 cup of phosphate-free laundry soap with 2/3 cup of powdered household cleanser to a gallon of H20. Mix well by stirring slowly. Add white vinegar to make it a multipurpose solution that cleanses and kills most mold spores and mildew. Mix 1 cup white vinegar to a gallon of water. The pressure washer dilutes the mixture, therefore increase the concentration if necessary. Is soap different than detergent? When Is one better than the other? Soap contains natural ingredients whereas detergents are chemicals synthetically produced. Detergents can be used with any water, but soap forms scum if mixed with hard water. Detergents are best used for disinfection and purification like cleaning mold and mildew. Soaps are great for grease and oily dirt. Any difference between professional and consumer grade soaps? The main difference is concentration. Consumer grade soaps are usually pre-mixed, ready for use. Some, however, need water added to the solvent before use. Professional grade soaps come in concentrated bulk and need to be mixed with water before usage. The amount of water required is much more than the water required by the consumer soap mixture. What are the main chemical ingredients and what do they do? Ammonia cleans stainless steel and glass. Bleach aggressively disinfects and sanitizes. Citric Acid removes stains and cleans wood surfaces. Potassium Hydroxide makes soap soft or creates liquid soap. Sodium Hypochlorite removes stains and disinfects. Sodium Hydroxide or caustic soda dissolves fat, oils, and grease on glass and steel. Vinegar polishes bronze and brass and cleans countertops and windows. Is Bio-degradable soap essential? When do you have to use one? Bio-degradable soap won’t harm plants or pets. Water waste management, however, is as important. If water waste isn’t managed, even if the soap isn’t harmful, the debris, grease, mold, mildew, and stains are washed away with the soap into the storm drains. Phosphates stimulate algae growth. Excess algae growth deprives the ecosystem of oxygen. If cleaning close to lakes and rivers, make sure the pressure washing soap doesn’t contain phosphate. The best combination to clean something is hot water and soap or detergent. It’s proven with washing dishes or clothes that hot water disperses grime and dirt easier than cold water. Soap molecules bind to the water molecules and forms clusters that trap the dirt and grease inside. The water washes the soap with the grime away. 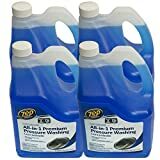 Can I use household bleach in the pressure washer? Household bleach may damage and destroy the seals and rings in the pump and hose of the pressure washer. It’s also dangerous to inhale, for pets and plants. If you must use bleach, cover plants before brushing it onto a controlled surface, make sure the water containing the bleach isn’t washed away to ponds, lakes, gardens or stormwater drains.